Anyone who has ever owned a motorcycle of any kind and done any type of maintenance on their own, from simple things like adjusting the chain all the way up to rebuilding a transmission or bottom end, knows that getting greasy is inevitable. Having been formerly employed as a mechanic at a race car shop as well as an apprentice tool and die machinist, I can tell you that among those of us in trades that require you to get ‘down and dirty’, a common topic of conversation involves the best types of hand soap for cleansing the sludgy mix of grit and motor oil that inevitably ends up coating your hands after a long day’s work. Common hand soap just doesn’t do the trick, and few of us want to head home to caress our significant other’s skin with blackened, grimy hands. Unfortunately, even the best “mechanic’s” soaps have a tendency to dry out your skin to the point of cracking, especially if you’re washing your hands as many as ten times a day. I won’t even talk about the guys I’ve seen dipping their hands into the solvent tank or scrubbing their skin with Ajax sink cleanser to get out that stubborn black residue. Although it’s easy to see that this kind of treatment can be harsh on your skin, fewer people realize that the drier your skin becomes, the more it absorbs dirty oil and the like. This means each time you wash your hands, they become harder to get clean the next. So while the word ‘moisturizer’ may conjure images of the women’s department of your local Sav-On, a moisturizer can be an important tool for a mechanic or hobbyist who likes to get his hands dirty. Enter Skin MD Natural Shielding Lotion. Rather than simply moisturizing the skin using oils, the Shielding Lotion is claimed to bond to the outer layer of skin to keep irritants out and moisture in, thus ‘shielding’ your hands from the ravages of harsh cleansers, and at the same time making dirt and oil easier to get off. A simple way to understand this is to think of it like applying wax to your car’s paint – the smooth surface allows dirt and oils to simply ‘flow off’. Skin MD Shielding Lotion comes in a 4oz bottle, and I’ve been using mine several times a day for 3 or 4 months without exhausting more than 2oz. The Shielding Lotion certainly seems to work as advertised, and it is certainly the most effective moisturizer I’ve ever used (I’ve previously tried several unscented brands available at my local grocery store). Start with a small amount (about the size of a dime) in your palm, and after a minute or two of rubbing it in to both hands, it is gone completely, with no leftover greasy or slippery residue like some lotions. The Shielding Lotion leaves your skin moist and comfortable without being greasy in appearance, either, something that has often bothered me with other lotions – would you want to shake a man’s hand if you noticed it was shiny and wet? 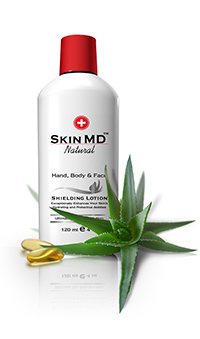 Skin MD’s Shielding Lotion allows me to wash my hands more often without my skin getting uncomfortably dry and starting to crack – which can be dangerous, as the cracks can allow outside contaminants like dirt, motor oil, or solvent into the bloodstream, possibly causing illness. Using the Shielding Lotion frequently also makes it easier to remove stubborn grease, like the spray-on oil used on foam air filters for MX bikes. Considering that you can get a 4oz bottle for $25 from SkinMDnatural.com, it seems silly not to try it. Your girlfriend/wife will thank you!